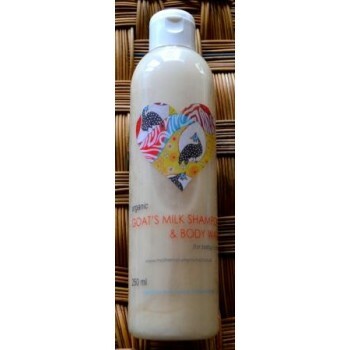 Description: Nutrient rich goat’s milk is used to smooth and hydrate dry, irritated skin. The natural ingredients are absorbed deep into your skin and hair. This natural shampoo and body wash helps balance the skin’s ph and is ideal for sensitive skin and scalps leaving skin and hair clean yet silky soft. Gentle and mild this no-tears foaming wash is highly suitable for babies. NO colour and NO fragrance · using both organic and plant derived ingredients. NOT tested on animals. This gentle formula is a blend that leaves your hair and skin clean without stripping it of its natural oils. All natural ingredients used and includes essential oils for fragrance. Preservative: low dose of 0.5% Phenoxyethanol (giving our products a shelf life of 6 months) - chosen because citric acid or alcohol (which are commonly used as natural preservatives) are known allergens even though they are "natural" preservatives. We have taken great care to ensure our skincare recipes use as little preservatives as possible.